The Ralph M. Brown Act was enacted in 1953 by the California State Legislature to ensure the public's right to attend and participate in meetings of local legislative bodies. The Act stipulates the process and procedures local bodies must follow to ensure the public has the right to a fair and open public hearing, and prevents secret or closed door proceedings unless for reasons specifically authorized by the Act. It has been 64 years since the Brown Act was enacted, and long gone are the days of the ditto machines, manual typewriters, slide rules, and pay phones. But one thing remains prominent in the political landscape of today, just as in yesteryear, and that is greed, power, and profit that influences city council decisions. Ralph Brown could not have imagined the invention of the cell phone and text messaging as a convenient, private, and often secret form of communication that may occur between our local elected officials and their big-monied constituents, otherwise known as the "industry group", "development interests", "stakeholders" or you name it. Specifically, I am referring to the private text messaging that could occur between City Council members and their development lobbyists, even while city council meetings are in progress! 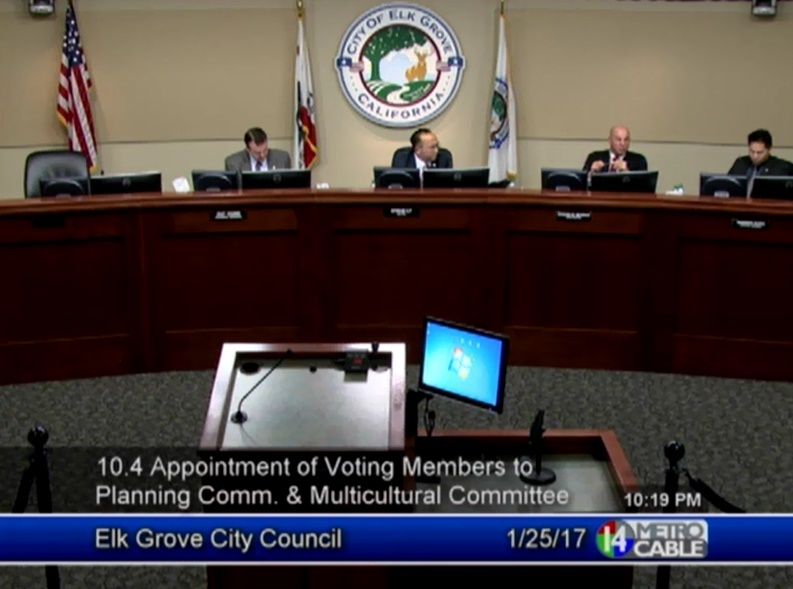 Circumstantial evidence and observations of texting by Elk Grove city council members and developers during meetings has probably been occurring most likely since the city incorporated in 2000. 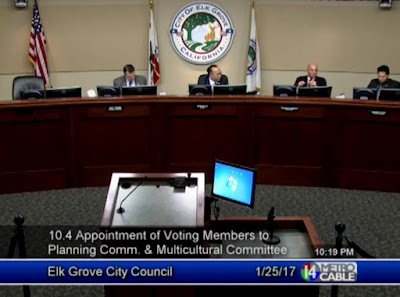 The latest example was the Council meeting of January 25th when Mayor Ly soundly rejected a Planning Commission candidate put forth by the other Council coalition. The entire room fell silent, and then a couple development lobbyists in the audience began furiously texting away on their cell phones. At the same time, the Council coalition tilted their heads downward and began working their cell phones in unison. Coincidence? How do we know if private conversations between Council members and "special interests" are taking place during meetings? The California Public Records Act of 1968 allows public inspection of government records unless exempted by law. It has been common practice to request written files, development applications, e-mail exchanges on the city server, contracts, etc. through the Public Records Act. However, it is unusual to request copies of text messages sent or received on city-issued or private cell phones. It would be even more unusual for the city to comply with that request, or for a private citizen to bankroll a lawsuit over the city's refusal to turn over such records. So what are the citizens left with in the name of transparency? Well, truly transparent cities have enacted ordinances banning the use of cell phones and texting by council members during meetings. In 2001, the city of Seal Beach became the first city in California to ban the use of cell phones by Council members during meetings. And since 2001, that list of cities choosing to avoid the appearance of impropriety have adopted this same measure has grown tremendously. Upon taking office as Mayor of Sacramento, Darrell Steinberg even went so far as to push that all city business be conducted on city servers. The honest citizens use their three minutes at the podium to exercise their rights of a free democracy. Let's have our City Council, who always preach more transparency, take the lead and adopt an ordinance to turn off their cell phones during their meetings. If anyone has anything to say to them, let them also approach the podium and speak on the record as well.